My favorite salmon are one of the least known and most secretive of all the Pacific varieties. As a result, they get less angling pressure in many places, and are very much misunderstood. The two main reasons for this are their diet, which unlike most other salmon, doesn’t consist of lots of baitfish, and the second is their unique choice of habitat. Sockeye, or red salmon, are the only one of the Pacific species to require a lake for their development. Of all the salmon species, only the chum or dog salmon join the sockeye as plankton eaters, and chums are not heavily sports fished, certainly not for table fare. Since the sockeye don’t chase down other fish and fast swimming critters, they don’t have the violent take that is so much the hallmark with silvers, chinook and steelhead. You can work a spinner all day and rarely have a sockeye give it much attention. Flies that imitate fleeing fish fry have little effect as well. To catch the fish, you have to imitate plankton! What is “plankton?” Well, it’s most anything that floats around in the water—plant or animal—that is smaller than a sockeye! So in reality, most anything will do! Sometimes you can catch them on just a red hook, sometimes a hook with some green yarn, other times a bit of tinsel. This confuses fishermen, and since the fish rarely go out of their way to grab a bait, and can be frustratingly slow to take it, a lot of us figure that they just don’t bite at all. Sockeye often swim up streams and rivers in huge schools, driving fishermen batty and sometimes encouraging anglers to try and snag—especially if they are convinced that snagging is the only way to get one on a hook. If the fish get hooked in the mouth, these anglers are convinced that they must have been “flossed.” Since they sometimes see fish swimming with mouths open, they figure the line slides into their mouths and pulls the hook up into the teeth and hooks them! As a result, a lot of fishermen put them low on their list as game fish. 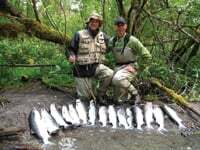 When we were up fishing the Situk River in Yakutat, Alaska, we found few other fishermen joining us. Despite really good runs of sockeye, the spring steelhead fishery and fall silver salmon runs draw most of the attention. That was OK with us. The liberal limit of six of the great eating fish and their amazing fighting ability was all the incentive we needed! We found spots in the short river (less than 15 miles from ocean to Situk Lake) that were only about 30 feet wide, with schools hanging in three-foot-deep drifts in large numbers. Since none of the fish had been long out of the ocean, they were bright and full of life. They literally tore us up. My left hand got hammered by the whirling handle of my fly reel! The fish jumped and jumped; netting them was a great source of humiliation as they easily dodged the net and swam between the netter’s legs! There were lots of bears around, but they’d wait to catch older fish; these were way too fast to catch with bear feet and claws! Some anglers dumped cleaned carcasses at the bridge, which I’m sure brought some bears, but we took everything back to the lodge. We didn’t want to encourage the big bruins to hang around. After a few days of fishing, we could really tell that the fish were biting our flies. When the bite was off, drifting a fly through the schools was pretty fruitless. With the big schools, one might occasionally get a foul hookup, but sometimes we just had to wait. Then, when the bite picked up, you could see the fish shift position to gently take the fly. If one moved away from the school or turned on its side, you’d better set the hook. They didn’t slam the bait, although if you got sloppy and let it pull into their mouth before you were ready, they could give you a shock! Some flies worked way better than others. One day the flies Bob Miller sold from his Situk fly shop, thinly dressed gray hooks with sparkly dressing, did the trick. The next day, the boys found that the fish were slamming bright red hooks, with almost nothing on them. I tried that my final day and got no action. My buddy Tom was getting hits on a bright pink fly so I put on a Caballero that my buddy Chuck Cameron had tied me in his little shop in Long Beach, Washington. The bright sockeye literally tore it up! I was lucky to have a second in my fly box. The fact that they were so picky did away with the snagging and flossing argument. They do bite, not always readily, but none of us old anglers or our younger descendants had any doubt that they could get a sockeye to bite on a fly! Some days the fish must have been dreaming about one kind of plankton, and other days, a completely different flavor! Once hooked, the fish went nuts. They ripped up and down the stream, jumped frequently and caused us a great deal of anguish! Get sloppy and they’d throw the fly. Get careless with your knot and they would figure out how to break it off. Likewise, you had to check for any nicks or weak spots in your leaders or tippets. I did notice, however, that the fish never really seemed to take advantage of the limbs, fallen logs, or other snags that were in the river. A silver or a steelhead would have tangled us in a heartbeat. This fish seemed to have the good manners to keep away from all the stuff on the sides and the bottom. We got to talking about the way they fought one night at our campfire. Our consensus was that it had something to do with the fish’s upbringing. Unlike all the other salmon, sockeye spend most of their first year living in a lake. Unlike chinook, silvers, chum and pinks, they don’t spend much time in streams. Their main defense is to stay with the school and head for deep and open water. After their year in the lake, floodwaters carry them the short distance down to the ocean, where they spend their years in the salt keeping away from slower predators by staying in the open water with their school. As a result, they may look at limbs, trees and roots in the river as ambush sites rather than refuges. Or maybe not, we could be completely full of bull. After all, most fishermen are like that! In our defense, we did catch well over a hundred fish during our time on the river, so we must have got a few things right… But then there were thousands of fish!